June 29th, 2008: Partly Cloudy and Warm, Water Temp 85* and Clear. Today was the first day I had off in awhile so I woke up early as usual and got the boat ready, woke my 3 year old grandson up, threw him in the truck with his breakfast and took off on his first Striper trip. Got to the Marina at 5, picked up good old friend Striper Al and went out and caught bait. Took an hour to get bait, found some fish main lake where no one else was fishing and put out 8 downlines. Before we knew it the baits got nervous and Michael put a Catfish in the boat. Al hooked up on a nice Striper a second after Mike picked up a rod and started reeling one in. Both fought their fish for about a minute and once I landed Al's fish Mike hollered out " Pa, I have a Big fish and I can't hold it anymore". I thought he had another Kitty but he had reeled a 6 pound Striper right up to the boat and it was flopping around on the surface. I threw Al's fish onto the deck and prayed I could get Mike's in before it broke off or he lost grip of the rod. 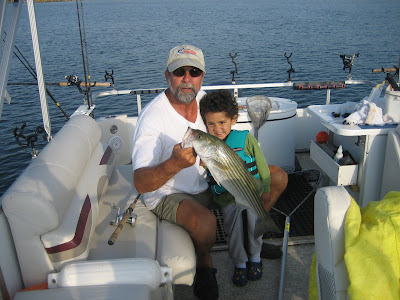 Everything worked out great, we boated the Striper and Al snapped a picture of My Grandson and myself holding his first Striper. This all happened within 10 minutes of putting the baits out and when we looked up there were 4 boats on top of us running over the fish and spooking the school. Obviously Michael enjoyed the experience of catching bait and fishing because I thought he would only be good for a couple hours this morning but he hung in there for 5 hours and it was Al and myself that called it quits. This was a morning that I will never forget and hopefully Michael will cherish the memories forever . No doubt he will remember today forever. I'm 43 and to this day I can still remember my first fishing trip with my dad and later my first trip with my dad, grandfather and uncle. I'm not an overly religious man but I think it's safe to say that you saw God today. 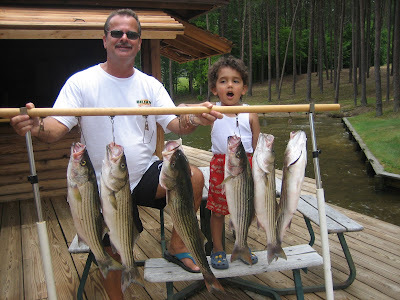 Congratulations and good on you for taking the time to take your grandson fishing with you. That has to be the greatest report that i have ever read of yours. I know how much it means to you and one day michael will cherish it as well.